When a middle aged Italian teacher was brutally beaten, sexually assaulted and left for dead in Rome last week, there was outrage. When a Romanian immigrant was arrested for the crime, it was the final straw for Italians who believe that Romanians carry out far more than their fair share of violent as well as petty crime. So the government, facing a wave of public anger, acted, passing a decree that will allow the police and judiciary to expel immigrants who are deemed to be a threat to public order. Around three dozen have been deported so far. 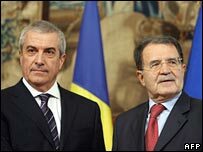 The crisis brought the Romanian Prime Minister Calin Tariceanu hurrying to Rome for an emergency meeting with his Italian counterpart Romano Prodi. After they met Mr Tariceanu made his way to the grandiose villa in central Rome that houses the Romanian Institute. Waiting in the courtyard were the great and good of Italy's Romanian community. Among them was Mariana Borita, a Romanian social activist; she was quick to scoff at the new law on expulsions. "As soon as the Romanians who were expelled last weekend got into the country," she says, "the Romanian police took their fingerprints and after that they were set free, because they had no written reason why they were sent to Romania. "I think by now they are back in Italy. It was not an effective decision." So what was it all about? I asked. "Just politics. A political game. Nothing more." It's a charge that Jean-Leonard Touadi, Rome's Deputy Mayor in charge of security, not unsurprisingly denies. Of African origin - his family were from Congo Brazzaville, and he was brought up in France - he seems an unlikely racist. The law is not intended to lead to mass expulsions, he patiently explains; every case will go before a magistrate, and if deportees return, well, they'll face three years in prison. Three years, he repeats, just in case the message is not clear. The decision to request the decree was not taken lightly says Mr Touadi. But a crisis point had been reached in the level of crime. "What we would like to prevent in this city," he says, "is private bands of people going everywhere to take revenge on Romanians. We have to prevent it. "Extreme-right groups are taking this opportunity to raise a racist culture. And they are trying to organise themselves to try and find Romanians, and give the city a kind of false revenge." These are not empty words. Three days after Giovanni Reggiano was beaten, assaulted and left to die, three Romanians were jumped, beaten and stabbed by a group of up to eight masked men. But the threat of expulsion has an impact on many immigrants, not just the criminal element. A stone's throw from Rome's ring road 20 caravans cluster under a patch of trees. 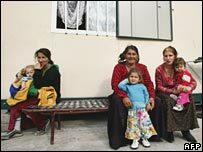 This is a home for around a hundred Roma of Romanian origin. Inside one caravan a family of eight lives in an incredibly small space; Romanian music wafts out of the TV set which is hooked up to a satellite dish on the roof. Mother of six Mirelle says she was abused on buses before the events of last week, but now she has another fear. "I wait for my husband to come home before I go shopping. I'm afraid. If I go out in the street they'll ask me for documents, and I don't have any. They'll send me back to Romania and my children will be left here. How will they survive?" 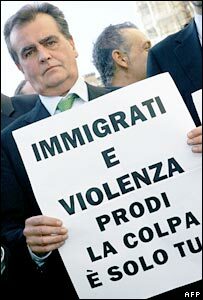 Mass expulsions are not going to take place in Italy. To see why not, visit any construction site in the country's capital. Half an hour south of the centre of Rome, at a canteen on an industrial estate, construction workers queue up for lunch. Plates are piled high with chickpeas in broth, scallopine milanese and a choice of pasta. A fifth of workers on one government project here are Romanian; they do the jobs, says one union organiser, that Italians either don't want to do any more or no longer have skills for. It would, says the project's manager, "be difficult for us to manage" without the Romanians. Italy is at one extreme end of Europe's demographic crisis; it has a catastrophically low birth rate. It needs to import workers for key sections of its economy to keep functioning. For Italy - and for much of Europe - the question is not if immigration should take place, but how it should proceed and if integration can be managed. This last week in Italy has not set a happy precedent.